For alcohol to cause intoxication, it must get into the brain. Once alcohol is consumed, it leaves the gastrointestinal (GI) tract to enter the bloodstream. This process is called “absorption”; alcohol is easily absorbed through cell membranes lining the GI tract into the blood capillaries. Once in the bloodstream, ethanol is carried to the heart, where it moves to the lungs and back to the heart to be pumped through the arterial system to all organs in the body. Learn how ethanol is absorbed into the bloodstream by filtration and passive diffusion. Learn how ethanol is transported through the bloodstream to major organs. Ethanol travels to the brain within the arteries that lie between the skull and the brain itself. These arteries branch out into capillaries, which dive deep into the brain tissue. Ethanol must pass through these capillaries to reach all cells (e.g., neurons) in the brain. For most molecules, it’s not so easy to get into the brain. There is a barrier called the blood-brain-barrier that protects the brain from foreign substances that could potentially harm this highly specialized organ. Unfortunately for the brain, there is no barrier for ethanol. Ethanol crosses the blood-brain-barrier very easily. This is due to its chemical characteristics—although it is somewhat polar, it is also lipophilic, and so it mixes easily with the fat in the membrane. Learn more about the chemical characteristics of ethanol. The capillaries in the brain form the major structural component of the blood-brain-barrier; they are different than other capillaries in the body. Outside the central nervous system, the endothelial cells that make up capillary walls are loosely attached to one another, and transient openings called fenestrae (meaning windows) in the cell membrane allow water, ions, and small solutes to move across the membrane. In contrast, endothelial cells of the capillaries in the brain are tightly packed together and no fenestrae are present, preventing the passage of most substances into the brain. To ensure that the endothelial cells stay “glued” together, specialized proteins reside in the cell membranes forming connections called tight junctions. These junctions prevent the movement of large solutes between the endothelial cells into the brain tissue. For extra protection, accessory cells called astrocytes wrap themselves around the capillaries, like insulation on a wire. Unless a molecule is small and lipophilic (attracted to lipid), it will have a hard time getting through this layer by passive diffusion. And just in case some molecules get into the brain that shouldn’t be there, there are specialized proteins that transport the molecule right back out again, much like a revolving door. These efflux proteins require energy to transport molecules out of the brain. This active transport process is common with some toxic anti-cancer drugs, which makes it difficult for them to penetrate the drug brain barrier. What makes it so easy for ethanol to cross the blood-brain-barrier? In the case of other biological membranes, ethanol moves across by filtration (moving through water spaces because it dissolves in water) and by passive diffusion (moving with the concentration gradient through the membrane itself because it also dissolves in lipid). In the brain capillaries, the lipophilic character of the ethanol allows it to move by passive diffusion across the endothelial cell membrane and through the astrocyte wrap. Ethanol’s small mass helps too! 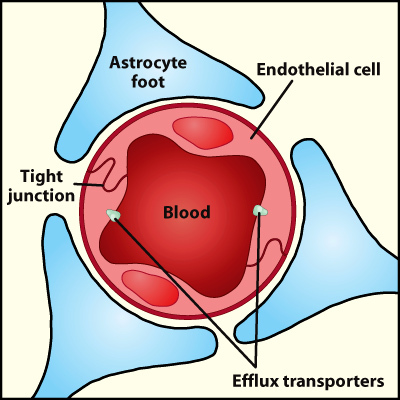 Figure 2.3 The blood-brain-barrier consists of tightly-packed capillaries without any holes (fenestrae) that are wrapped with a layer of fat by astrocytes. Efflux transporters (proteins) help to expel foreign substances that might sneak through the capillary membrane. Although the physical restrictions imposed by the blood-brain-barrier limit the delivery of drugs or toxins to the brain, other small lipophilic drugs can diffuse passively across the blood-brain-barrier including, nicotine, marijuana, and heroin. In addition, water soluble nutrients such as glucose, and large water soluble molecules such as vitamins, do get across to reach all cells in the brain. These compounds are carried across the barrier by proteins called transporters. This process requires energy, and is known as active transport. The blood-brain barrier provides a layer of protection for the brain from harmful or foreign substances. Specialized capillary membranes in the brain are essential to prevent the nonselective passage of molecules across the blood-brain barrier.